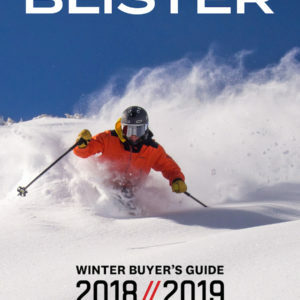 Nordica hit a home run this past season with their revamped Enforcer (see our review), and for an encore, they made the Enforcer 93, which is available now for purchase. I didn’t read any marketing copy on the Enforcer 93 before getting on it, so I was approaching this ski with a pretty blank slate. And the two pressing questions for me were: (1) How similar or different is the 93 from the 100mm-wide Enforcer? (2) Did Nordica nail it again with this ski? (1) Check out our measured weights of the two skis. (2) The tip rocker lines of the two skis look identical, as do the tail rocker lines. (3) As for the amount of tip and tail splay, the Enforcer 93 has the exact same amount of tip rocker as the 100, and the Enforcer 93 actually has slightly more tail splay, 4-5 mm worth. (4) The Enforcer 93 has a touch more traditional camber underfoot, but as we put more days on the ski, that difference between the two skis will diminish a bit. Given the similarities, I worried that Nordica saw the success of the Enforcer, then quickly slapped together a slightly skinnier ski, since we’ve seen that simply shrinking or widening the specs on a good ski does not always make for a successful spin off. But whether Nordica rushed on this or put the Enforcer 93 through a bunch of testing and prototypes, the end result is that they have produced another very good ski. I really like the weight of the Enforcer 93. This is not a light ski, but it is also not a seriously stiff ski. That can make for a nice, silky ride that isn’t demanding (cf. the Enforcer 100). I like, too, that this is not a heavily tapered tip. 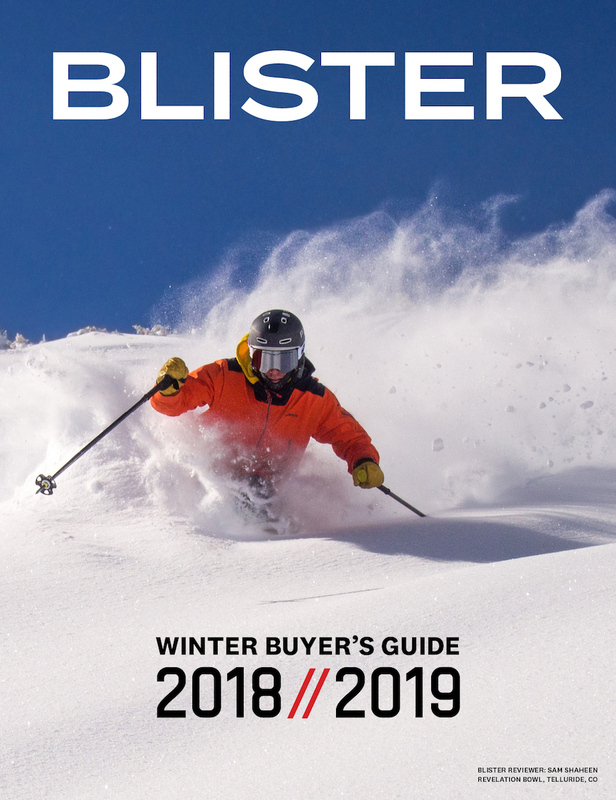 In my opinion (and especially when designing skis for advanced skiers) the skinnier the ski, the less taper you need to make the ski “quick.” Taper that tip, and you risk giving up too much tracking ability, and the ski feels twitchy. The Enforcer 93 is not twitchy. I reviewed both the Enforcer 93 and the Enforcer 100 fresh from the wrapper, without detuning either ski. But the Enforcer 93 came sharper than the 100, and given the similarities of these two skis, I can say with confidence that either ski can be sharpened up or dulled down to allow you to dial in how much bite you want vs. how loose and slarvy you’d like the ski to be. The Enforcer 93 is certainly fun on groomers. When A/B-ing it with the Enforcer 100 this past weekend, it did feel to me that the Enforcer 100 was a bit better at (1) carving at slower speeds and (2) making a variety of turn shapes. The Enforcer 93 didn’t feel quite as easy to bend. But that isn’t to say that I found the 185 cm Enforcer 93 to be demanding, I think I was just impressed by how good the edge hold was on the ski, and how hard and fast I could push it. When I made myself stop being all excited and actually slow down, I could work the Enforcer 93 through shorter turns, but I wouldn’t say that the 185 cm Enforcer 93 excelled here. However, I think that dropping down to the 177 cm Enforcer 93 would surely open up this ski’s ability to do shorter turns at slower speeds, and in this particular regard, I suspect that the 177 cm Enforcer 93 would feel a bit more like the 185 cm Enforcer 100. 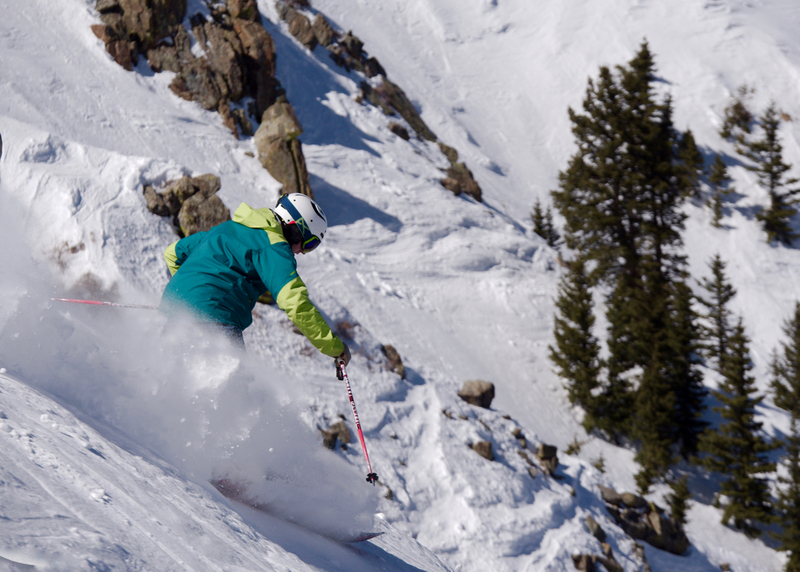 The 185 cm Enforcer 93 felt awfully capable everywhere at Taos this past weekend. Saturday was a pretty warm, bluebird day, and conditions were pretty spring-like. But Sunday was overcast, and the mountain never really softened up. Conditions were firm, very fast, and overall challenging. In fact, on Stauffenberg, one of our friends caught an edge on her second turn from the top, then proceeded to tumble and slide about 700 feet down the line, unable to self arrest. It could have happened to any of us (she’s skied that same line probably about 100 times), and thankfully, she’s okay. I had actually dropped in just before her, and it was only my second day on this new ski. I had zero reservations about dropping in, and in fact, my last words before going were, “This looks great” — the conditions were fast and firm, but coverage was excellent. 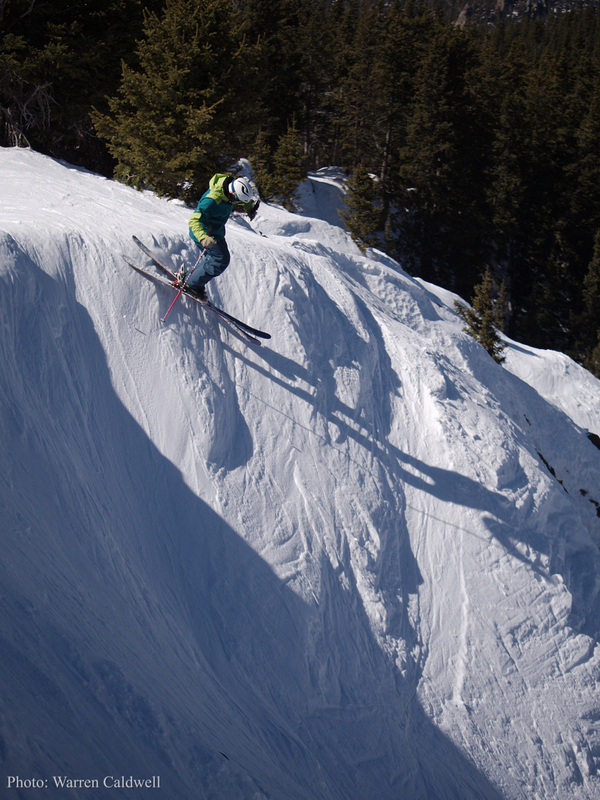 Jonathan Ellsworth on the Nordica Enforcer 93, Stauffenberg, Taos. I felt solid and confident on the 93s, and felt comfortable skiing Stauffenberg fast. It was only after our friend’s slide that I realized the Enforcer 93 deserved quite a bit of credit for how well it handled the conditions—those conditions weren’t as “great” as I suspected. In firm, steep entrances off Kachina, I also felt a lot of confidence in the Enforcer 93. They afforded very good bite (especially for being as tail rockered as they are), yet I could break the tails free when I needed to. The Enforcer 93 felt like a very capable all-mountain ski down Main Street and all across the K Chutes. I had zero complaints, and I never wished that I was on some other ski. NEXT: Trees, Moguls, Sizing Recommendations, Etc. I was pretty excited when I saw this ski come out. I usually skit he Moment PB&J but was looking for something a little narrower and with a more traditional tail for when conditions harden up. Something mostly to blast around groomers on. I was seriously considering the Armada Invictus 95TI but it got really mixed reviews on the conditions I’m looking to ski. I guess the only thing I see here that’s concerning is a little lacking with the shorter turns at slower speed. One question, I’m 220 Lbs, strong skier. Currently I’m on either LIne Prophet 115 (186) or the previously mentioned Moments (188). This review seriously makes me want to consider downsizing to the 177. Do you think they’d be too short or I’d be real uncomfortable at high speeds? I know there’s really no definitive answer there but just looking for your opinion. Hi, Don — a “220 lb. strong skier” should have zero problem handling the 185 cm Enforcer – you have 40 lbs. on me, so you ought to have an even easier time bending this ski and getting it to carve at slow speeds (if you’re just sliding around on bases flat at slow speeds, then there isn’t even a question here). Furthermore, if you’ve never felt like your 188cm PBJs were too long, then I think you’ll be just fine with the 185s. Long and short: I didn’t mean to suggest that this is a cumbersome ski at slower speeds, I mostly meant to convey that if someone is primarily interested in making lots of turns at slow speeds, I don’t think the Enforcer is the best choice. Perfect…thanks for the clarification! I’m going to try and demo them somewhere but you know how that goes. What you described was kind of my other train of thought. I have no issue carving the 186 Line Prophet 115’s and they have a decent amount of metal in them. In regards to your other comment, I’ve never felt the PBJs were long at all. I usually try to keep my size in mind when I read your reviews since I”m a bit bulkier and flex skis easier. I seem to have forgotten this time. Haha! I’ve just spent 4 days on the 93’s in 185cm, and have skied my enforcer 100’s since last March. 6’5″, 210lbs. I find them to be much quicker and more playful than the 100’s, and for me they ski shorter. Agree that in factory tune they hold ice well (NE skier here) but not like my xdrive 8.8’s. Had them both out on boilerplate at Okemo yesterday, spent 3 hrs on the 8.8’s in the am, then on the 93’s in the aft. Initially felt the edge hold lacking after the 8.8’s, but after a run or two I felt comfortable again. As the sun set the death cookies got nice and hard, I would have preferred the 8.8’s. All in all, the 93 is a great ski for softer snow but in a pinch it will not let one down on the steep and icy. Great review by the way, curious as to why a fellow skier who also owns the 100’s commented that he heard the 93 skis shorter 185 vs. 185. I surely don’t get that sense, thoughts? The usual excellent, thorough review. Thanks! Lotsa buzz on the interwebs about mounting both Enforcers at -1 or -2. Where did you end up on mount for each of them? Thanks, Tom. I’ve got more days on the Enforcer 100 than on the Enforcer 93, but at no point have I personally ever felt like I wanted to deviate from the line. Mount location is a pretty subjective thing, but both skis feel well balanced to me at recommended. Their mount point of ~8.5 cm behind true center is a little bit forward of very traditional mounts, but not by much. I’m wondering if those saying they wanted to move back are skiing lengths that are too short for them, or the skis they’re coming from are mounted around 10 to 11 behind true center? I can add some context to the mount discussion. I had the 100’s in March of last year (2015). I’m on the 185’s – I’m 6’2″ and about 180. They ski short IMHO, and I found them to have lot of tail. To be fair, I was coming off 185 Cochise and 185 OG Enforcers. Figured maybe I had mismounted them, checked, confined and they were right on the dimple. I even lined all 3 up (Cochise Enforcer v2 and OG Enforcers) standing on tail and the toe piece (all FKS 14s) on the Enforcer v2 was significantly ahead of the other, I figured “what the heck” – moved them back 15mm and boom, drop the mic, these went from “meh” to “wow”. Just my experience, put a review on Epic, others tried them w/ demos at -1 and liked them better. Still a personal choice and I’d recommend if you demo, try them at both. Just my $0.02 and worth what you paid for it. Great review. I’ve been eyeing up the Enforcer 100 but now that the 93 has come out I’m thinking it’s probably more suited to my usual ski conditions (Australia – typically icy in the morning, soft in the afternoon, lots of fun off piste areas and the occasional powder day). So time for the typical sizing question… I’m 5’7, 145lbs, expert skier (raised in BC, not Oz). As a reference I’ve skied the Bonafide in a 171 and had a great time but came away feeling it was a bit too stiff for me in some conditions (tight chutes, moguls). It looks from the reviews that a 177cm Enforcer 100 would be spot on but do you feel the Enforcer 93 in a 177 would also be suitable? Really value your input, I can’t actually find a pair of Enforcers to demo down here! Wondering if the 2016/17 enforcer 100 exactly same construction as the 2015/16 model? 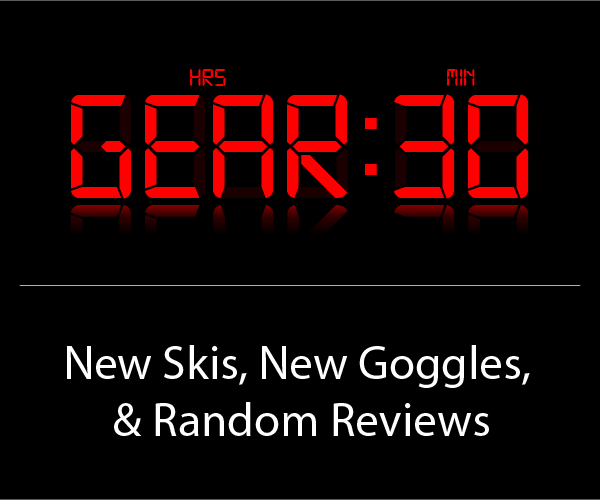 Demo’d it last year and loved it, very quick, easy and intuitive ski. Would have bought it except for I felt it had a very soft tail. Curious if any changes for this year? Re: 93’s or 100’s, has anyone tried these on telemark gear? Is there enough tail rise to confidently ski switch on groomers? RLK, thanks for the info on mounting position. Having checked them out, the answer to the second question is, no, they are not appropriate for skiing switch. I took them back and got a pair of Line Chronic skis. Best resort tele ski I’ve ever owned!! I just got a pair of these for telemark and mounted them at the factory recommended center with hammerheads (position 4/5). I’m 190lbs and ski pretty hard so I went with the 193s, they are super stable, carve super hard, love to charge, turn quick in bumps and trees and send it hard. They carve up hard pack, push through crud and have great float in powder. 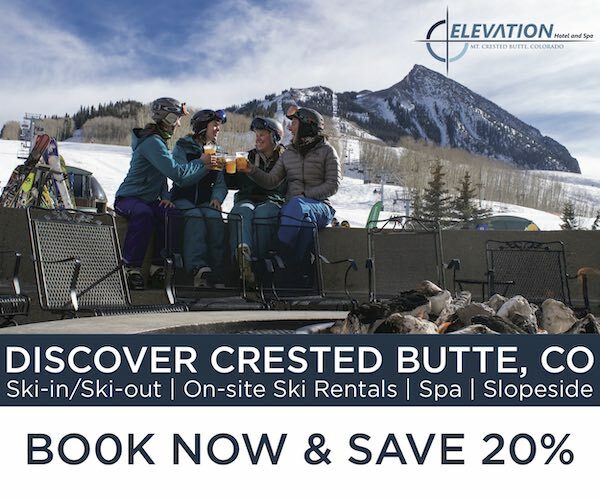 I’ve skiied then at Steamboat, Eldora and Winter Park in pretty much every normal condition except boilerplate ice, 12″+ power, and spring snow. I used to ride an aluminum hardtail mountain bike and switched to steel a few years back, I’ll beer go back, getting on these enforcers is what that switch felt like. The only two downsides are that they are heavy so I didn’t want to put a touring binding on them. Also, the length makes them sometimes catch a tail in the woods although I’ll probably get used to that. Also, if you don’t like skiing fast then you’ll have to work to slow them down, they want to rip! Ops, forgot to mention, I’m on the 100 waist. I’ve own the 100s and live in Boulder so those ski areas are my stomping grounds. Ice unreal. I’m from Michigan and had a really awful day at steamboat boiler plate ice and they were confidence inspiring considering. Crud and chop where these thrive. Super damp and has enough energy to make you not think about it. Steeps yes…These love steeps and once again, confidence inspiring. Groomers just wants to go fast and capable of small radius turns too without thinking. Powder. Had these in about 12″ at Mary Jane up in Parsen’s Bowl and the trees and did great. That being said my DPS 99 are a better powder specialist but the 100s are more than capable. Just not as nimble and my DPS (a lot less rocketed). Net net this is my go to for 99% of days and I’ll prob be burried w/ these skis. You just ski without thinking and if you’re a strong skier you’ll love. One comment. The factory tune is spot on. Don’t detune tips as they lose a bit of that energy and bite. Touring Binding Marker Tour F12 EPF to this while still 80% piste. (Åre Sweden) and some off piste deepsnow and touring. Do you think 169 or 177 size would be best? Hi Jonathan, This is a great review. I have been skiing Nordicas for at least 15 years and jut love the skis. I am 60 years old, 145 lbs and an expert skiier. I have a read a number of reviews that indicate that the enforcer 100 is too stiff for a lighter weight skiier. At my age I do not need to fight the ski to get it to turn. I rarely ski bumps any more but like steeps, crud, and an excellent powder day. I would very much appreciate you insight into the enforcer 100 or 93 as a ski for me. You should demo them. I am 64 years old, 160 lbs., advanced, not expert, east coast skier. I demo’d the 100’s in 177cm length last Feb. on a day that was forecast to be a powder day, but we got overnight rain/ freeze, then a bit of crud instead. Not great conditions for a demo, but I didn’t feel like they were too stiff. They handled the soft clumps and small moguls on the edge of steep trails very well, but were nothing special on the boiler plate. I didn’t have the right conditions to really test them, but certainly didn’t feel like they were too much ski. I am considering them as my bigger snow day skis. We don’t get a lot of powder days here, so I want a 2nd pair of skis that can handle a range from a few inches of fresh snow and slush to powder, and of course, ice. My current skis can do that, but something a little wider might be more fun in more snow. I haven’t decided if this is the right ski yet, but the 100’s I tried were not too stiff. My current skis are Rossi Experience 88’s, in 170cm length, also not a stiff ski. You mentioned “But if you value ease and quickness over stability at speed, then there are better options in the ~88-95mm wide range.” I value ease and quickness over stability. What would you recommend that I look at? I’m 5″9″ 160lbs and I’m a pretty strong skier. I love speed. I’m on the east coast. I’m looking for a good ski for all conditions. Do you think I should go with the 177 or the 169? Have you demo’d anything comparable? I am the same size and weight as you, and an advanced East Coast skier, leaning toward the 177 Enforcer 93. I’ve been unable to find a demo this late in the season where I ski (Okemo in VT). I recently demo’d Blizzard Brahma in both 173 and 180, Volkl Kendo in 177, and Enforcer 100 in 177, and liked all 4. Any one of the 4 could work well for me, though they are all different. 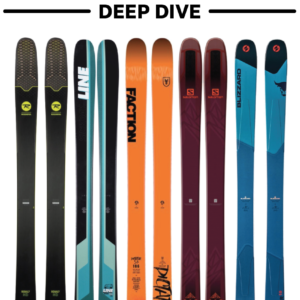 People who have skied all of these skis and the Enforcer 93 recommend the 177 for me. I think the 169 Enforcer would be too short. Update: I bought the Enforcer 93s, 177 cm, and I’m very happy with them. They are the right size for me. I thought Jonathon’s review was spot on, but I’m a bit smaller and lighter and not the ski Godzilla he is. The 177s seem perfect for me. I also really liked Blizzard Brahmas (tried and liked both 173s and 180s, different, but either size could work for me) and the 177 Kendo. I thought the Brahma was the best carver on boilerplate, Kendo was also a great carver and a bit more playful in softer snow, and the Enforcer 93 was in between. It seems to be good at everything. This season I will be at Whistler. Though, I don’t know which conditions to expect throughout the season, since I here different opinions. So I’m unsure which ski would be great for a one-ski-quiver. I kind of feel like my Nordica Enforcer 93 would still be a good fit for instructing at Whistler Blackcomb. 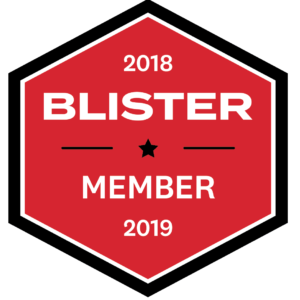 Could you comment on your experience with the conditions at Whistler and what you think of the Enforcer 93’s suitability for this, especially in deeper snow? This would be great! Thank you so much Jonathan, for your top notch reviews! Hi I am 60 , an instructor and I have the Enforcer 100’s. best ski ever! I moved the binding back 2 cm approx. 3/4″ and wow I really like it. The forward mounting position is to make it easier to ski for ‘everyone’ I know how to ski. works better back. Forgot to mention, this is not an everyday ski, works best with something under it but is good on groomed. I will be getting the 93. I have Head irally supershapes 76uf for when its not snowing. Fun times 10! I own two pairs of skis, the enforcer 100 177 (bought first) and the enforcer 93 177 (bought for when I need more edge on icy conditions). My skis before that were Bllizzard Brahmas 173. A strange quiver I know, but as an intermediate skier they feel like very different skis. I take both in my car and choose on the day….is it too icy for my 100s or can I take them….. The 93s are a very versatile ski, in other than deep powder and probably the most practical and capable one-quiver ski I could find. If I follow better skiers off-piste they are the skis because they are a little faster edge-to-edge. (actually fast enough for anything in my humble experience. If I had one ski it would be them…..but the 100s are the sweetest skis and I like them much more. Better carving, better energy, smooth out crud and bumps. They keep giving that thing where I am going much faster than I think. Question – I am 42 years old, 6’1” and 180 lbs and have been skiing for 35 years. I am a intermediate-advanced skier. A good bit of groomers, softer un-groomed runs when the conditions allow, and some sparse runs in the trees. Nothing too much with moguls or double black. I do like to go fast I am looking at the Enforcer 93 but I am stuck between the 177 and 185. I skied the Brama 180 last season and liked it. I’m leaning towards the 177 at is it closer to the 180 then the 185. Any thoughts on which I may prefer? Im surprised about the lack of discussion about mounting point in the text. I have just ordered a pair in 185. The only comments I see prefer to mount back a bit. I like my bibby Pro 190 on the mark and I have mounted most of my skis just on the mark. The last skis I tested was the Peacemakers mounted +1 and for me that was just ridiculous. The skis felt like snowblades. When I read the review for the Peacemaker I see recommendations to go forward at least 2 cm. So if the same people find the E93 mark to be great, would I be better off going back a few centimeters?